The perfect companion for your iPhone, the iXpand™ Mini Flash Drive lets you free up spaceon your iPhone, back up your camera roll, and even watch videos straight from the drive(5). The Lightning connector works with most cases and the USB 3.0 connector plugs into yourMac computer or PC, making file transfers quick and easy. The drive also includes password-protection software to keep your sensitive files secure across your devices(6). Take all the photos and videos you want—with the iXpand Mini Flash Drive you’re always ready to takemore. 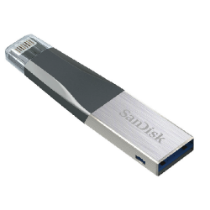 Free up space on your iPhone or iPad quickly and easily with the iXpand Mini Flash Drive(1). Plug in the Lightning connector and you can easily move photos, videos and other files off your device and onto the drive. From there, you can transfer the files onto a PC or Mac computer or store them on the drive. You can also save directly to the drive when using the app to take photos and videos. Set the iXpand Drive app to automatically back up your iPhone or iPad camera roll anytimethe drive is connected No need to manually select which photos to back up. Every time youplug it in, it does the work for you. You can also back up the photos and videos from yoursocial media accounts(2). The iXpand Mini Flash Drive supports popular video formats(.MP4, .MOV) so you can store and watch videos straight from the drivevia your device(3), making it a terrific travel companion. The iXpand Mini Flash Drive is designed to plug directly into your iPhone or iPad withouthaving to remove your case. Plug the drive into your computer’s USB 3.0 port and transfer files fast. Available from the App Store, the iXpand Drive app makes it easy to manage photos andvideos and also enables you to watch popular video formats(3) directly from the drive.